Existing Conditions: The first work on the project involves documenting the parameters within which we will design. This typically includes assisting the owner in obtaining architectural floors plans and any details if available. If the project is a renovation the initial work also includes measuring the existing residence. I also review the zoning and building codes and regulations, HOA architectural regulations if relevant to the project that may have an influence or constraint on exterior or interior renovations, and determine the need for consultants. Proper channels of communication are established. Before beginning the actual design work, I work with my clients to get a clear idea of their needs and desires for the project. Then, based on my clients’ functional needs, aesthetic preferences, and budget requirements, I prepare a number of sketches that illustrate the basic design ideas. These are often hand-drawn, and include floor plans, the most important elevations, and a section or two. 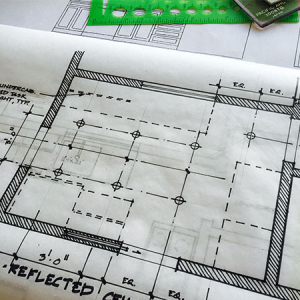 This Schematic Design phase, like all of the design process, is iterative. A design is created, and then I get the owners’ feedback on it, and then refine the design, or even produce an entirely new one, based on that feedback. The sketches provide talking points. They bring out the issues, and help both client and interior designer focus and move toward appropriate solutions. We take a first pass at specifications for materials and assemblies to be used in the work toward the end of this phase. Before proceeding to Construction Documents, I recommend having several contractors develop “ball-park” estimates based on the Preliminary Design sketches, to make sure we’re on track with costs. If we need to, we can adjust the scope and quality of the work to meet the owner’s budget goals. We also determine a preliminary Project budget and schedule. Based on the approved budget and design direction, next we “develop” the design. Additional drawings are prepared that explore and convey all aspects of the design, in more detail, and preliminary specifications for materials and techniques to be used in the project. 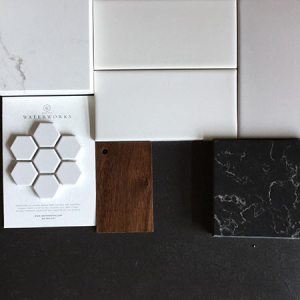 Suggestions for materials, finishes, appliances, lighting, and plumbing fixtures and fittings to be used in the work are made. As we move through this Design Development phase, we refine the design, modify it here and there, adjust and rationalize dimensions to fit specific components chosen by our clients, and generally flesh out what had been the rough design ideas. Ideally, by the end of this phase, our clients have made many of their choices of materials, fixtures, appliances and so on. The contractor reviews building materials and construction methods to ensure cost control. Project schedule is reviewed and updated. In this phase, a set of scaled construction drawings and specifications are prepared, which are adequate for complete pricing and construction of the Project as designed (“Contract Documents”). Based on the final Contract Documents, further documentation is prepared as may be required to assist in obtaining approval from the local Planning and Building Departments. 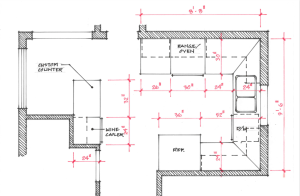 While the permit is being processed, I continue to prepare drawings and specifications setting forth in detail the requirements for the construction of the project. 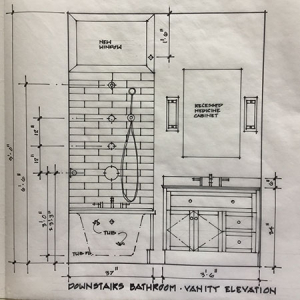 These Construction Documents include interior details, interior elevations of rooms such as kitchens and bathrooms or other rooms with lots of detail, cabinet and stair details, interior materials and finishes, and specifications. The specifications describe all the materials and techniques to be used, including special materials and finishes – such as low-toxic paints and FSC-certified lumber. Construction Documents are submitted to awarded Contractor for Building Department submittal to secure necessary permits. 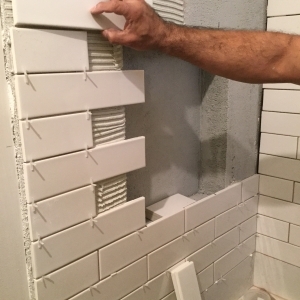 Designer ensures Contractor reviews and updates construction costs. This phase includes showroom visits for final color selections, price requests, purchase orders, cutting checks, depositing checks, ordering cuttings for approval, approving cuttings, reviewing acknowledgements, expediting, coordinating inspection with the receiver, inspecting goods, paying vendor bills, paying freight bills, paying crating bills, paying delivery and installation bills, resolving damage issues, coordinating deliveries, coordinating installations, meeting installers and resolving problems. If my clients have not already selected a contractor, I assist them in obtaining bids or negotiated proposals from contractors and in awarding a contract for construction. This includes preparing bid documents, going over the plans with contractors, analyzing and comparing bids, etc. If the permit processing times for the jurisdiction in which the project lies are long we often submit the application for permit on a more limited set of drawings, to get that going, and continue with the rest of the work of the Construction Documents phase in parallel with the permit processing. The Permit Set typically includes a site plan, floor plans, elevations, details, finish materials, specifications and notes, as well as information on energy use of products and materials. Essentially, the design process is completed on site during construction, in collaboration with the owner and contractor. The Construction Administration Phase begins with a preconstruction meeting with all parties. On site any atypical connections and transitions are worked out, using the “three heads are better than one” approach. A once-a-week site visit with owner, contractor and architect works really well for this. Work in this Contract/ Construction Administration phase also includes answering clients’ and contractor’s telephone questions, review of shop drawings, and assisting the owner in determining amounts owed to the contractor. Other tasks include submittal and shop drawing review and processing, material finish and color selection, answers to questions that arise during construction, coordination meetings, and change order processing. Conduct inspections to determine dates of completion. Assist Client with move-in. Execute punch list and expedite resolution of all items. Coordinate completion of project objectives.